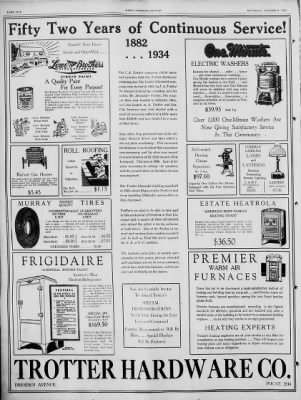 Tri-State Supply, (Trotter's Building) 624 Dresden Ave. Repairs being made after bricks fall from building March 12, 2013 By JO ANN BOBBY-GILBERT - East Liverpool Reporter (jgilbert@reviewonline.com) , The Review Save | EAST LIVERPOOL - A downtown business will be open as usual today despite having lost a portion of its brick facade over the weekend. About 16 courses of brick fell Saturday from the top of Tri-State Supplies on Dresden Avenue, tumbling to the sidewalk and into the street, luckily not hitting any passersby or damaging adjacent buildings. Owner Rick Dieringer said Monday, "It looked a lot worse than it was. Thankfully, no one was underneath it and got hurt." Mike Pusateri Excavating was called in on Sunday to remove remaining loose brick from the building and clean up the brick and debris that had fallen to the street, which was blocked to traffic Saturday and remained so on Monday. 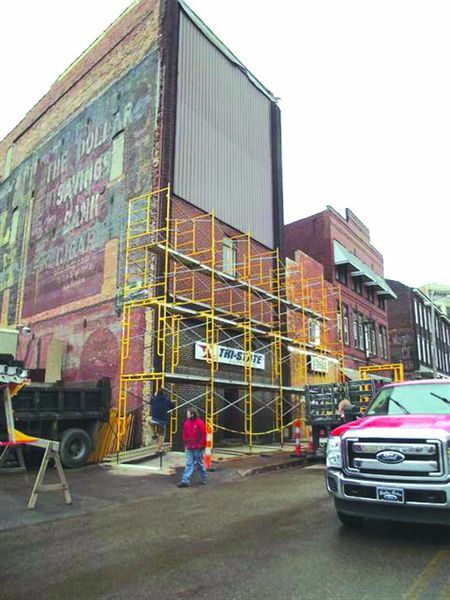 Cowan Masonry and Al Hissom Roofing and Construction were on the scene Monday, making repairs to the building that Dieringer said he believes was built in the late 1800s to early 1900s. 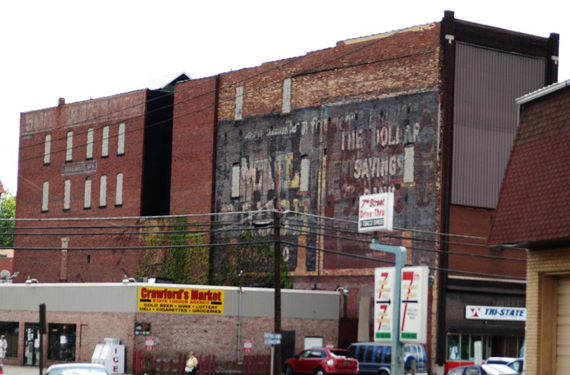 It originally housed Trotter's Hardware, whose sign is still painted on the side of the brick building. The glass windows in the storefront that escaped damage Saturday were bricked over Monday, and scaffolding was being erected by Hissom to begin the process of repairs, which he estimated might take a few weeks, depending on what an inspection shows. 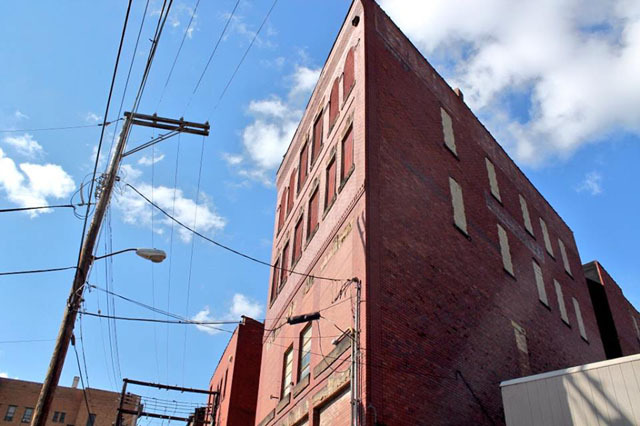 "Until we put our hands on those columns, we don't know for sure," Mark Hissom said, referring to the two brick columns running on either side of the building's front wall. Dieringer said some media reports erroneously had the building partially collapsing and doomed to demolition, but he said, "The four floors are not in the basement. The floors did not collapse inside the building. Nothing is going to be demolished." The damaged portion was covered Monday to prevent any further damage from the weather, which was blamed for the falling brick. Dieringer and Hissom said this winter's thawing and freezing cycle most likely caused the brick to loosen and fall, helped along by recent heavy winds. The fourth floor where the damage occurred is used for storage and as a catch-all, according to Dieringer, who said he still conducted business Monday, but primarily shipping and receiving from the back entrance. The back of the building. The open door in the center is where we entered. We entered on the first floor in the back, went a short distance and went down some stairs into the basement. Some of the basement ceiling. Shanno Langdon closest to the camera, Jeff Landgon in front of her. Yucky camera took a fit.